Scottish LGBTI Squash Open | LEAP Sports Scotland LGBTI Open Squash Championship on 10th June in Edinburgh. "> LGBTI Open Squash Championship on 10th June in Edinburgh. Colinton Squashers to host Scottish LGBTI Open Squash Championship on 10th June in Edinburgh. 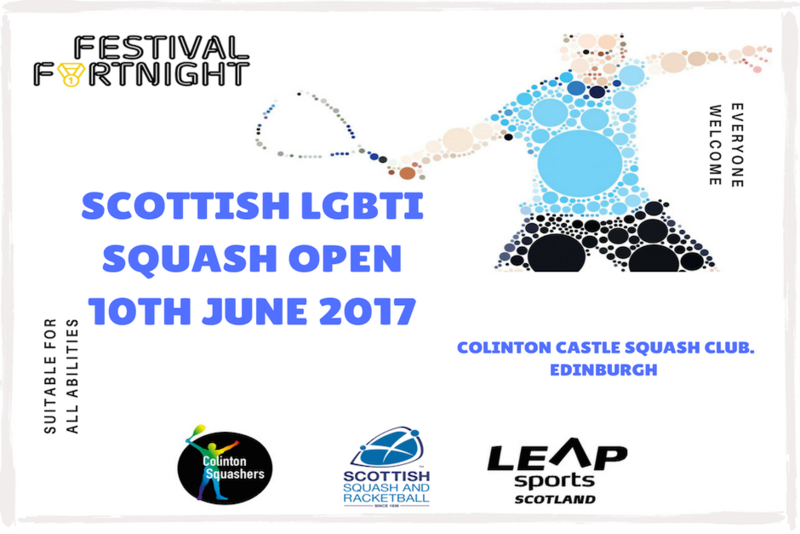 Colinton Squashers will host the Scottish LGBTI Open Squash Championship on Saturday 10th June at Colinton Castle Squash Club, Edinburgh, as part of LEAP’s Festival Fortnight. Players will be welcomed from across the UK and from further afield. Players of all abilities will be welcome to come along and compete and there will be medals awarded in A, B, C and D category groups, so there’s something for all ability levels to aim for. Funding from LEAP Sports Scotland has been used to cover court costs and prize medals. As such, the entry fee is now only £5, with an optional tournament tshirt at an extra £10. Soup, rolls and bananas will be provided for all entrants. There is also the option of a tournament dinner afterwards. This tournament is organised by Colinton Squashers and will be played as part of the LEAP Sports Scotland Festival Fortnight supported by Scottish Squash and LEAP Sports. Written on 28th March 2017.